On our new episode of Off Peak, we look back on the history of something we use everyday but rarely think about: roads. Barbara Bogaev traces the evolution of American roads from their origins as ancient paths for mastodons (yes, you read that right), to the rutted muck tracks travelled by horse-drawn carriages, through their often abandonment during the height of the train era, and on to their resurrection as smoothly paved streets designed for bicyclists (yes, you read that right too) and later cars. 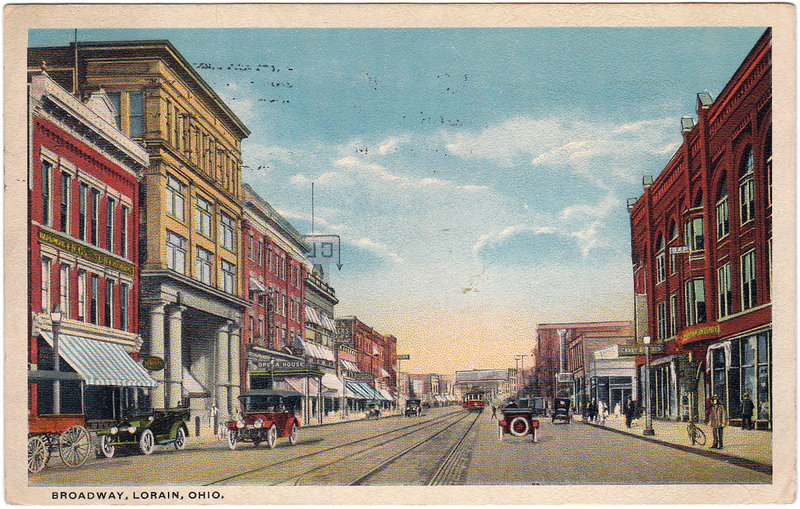 A road in the early 20th century in small town Ohio. Roads seems so permanent and universal: cars, people and bikes all have their own designated areas; pedestrian crosswalks allow for (usually) safe passage, budgets routinely include line items for road maintenance and improvement. But none of this was pre-ordained. How we arrived at the car-covered roads of today is a tangle of coincidences, conspiracies and market forces no one would have predicted. We talk with Carlton Reid, and author of Roads Were Not Built for Cars who takes us through the story of the bicycle’s largely forgotten role in the development of roads and streets (and cars) of today. There was a time when bicycles were the preferred vehicle for the rich and the privileged. Diamond Jim Brady, for one, had a bike encrusted with diamonds. Writer Dan Koeppel explains that bikes were so big back in the late 1800s that an eccentric businessman, Horace Dobbins, envisioned building an elevated bike path for commuters between Pasadena and downtown LA. When the 110 Freeway was built it used stretches of the California Cycleway’s right-of-way. This is why Dobbins is considered the godfather of the freeway. Once automobiles came on the scene, all bets were off. Historian Peter Norton explores how cars gained the upper hand on the roads, despite the fact that people were originally terrified of the smoke belching machines which every year mowed down thousands of men, women and children accustomed to talking, gathering and playing in the streets. Episodes will be released every other Sunday for the next two months. Please subscribe and like us on iTunes if you do, so others can find us and we can keep bringing you these stories. Off Peak was produced by The Glue for Metro.